By the time this week is over with, I'm pretty sure I'll be sick of Mexican inspired dishes! In honor of Cinco de Mayo, I felt compelled to make a dish despite the other Mexican inspired dishes I made yesterday for the pre-celebration and the other Mexican inspired dishes planned for Saturday for a dinner event I'm hosting. But alas, here is a pretty simple Mexican lasagna of sorts. In a saute pan over medium high heat, crumble in your ground beef and chorizo; brown. Add the minced garlic and diced onion. Stir and cook until softened. Add the taco seasoning, and salt & pepper to taste. Remove from heat and allow to cool slightly. In a small bowl, combine the ricotta cheese and egg until incorporated. Season with salt & pepper to taste. Set aside. In a 9x13 inch baking pan, lightly butter the bottom of the pan. Place 6 corn tortillas on the bottom of the pan, overlapping as needed. Top the corn tortillas with 1/2 of the refried beans. Top the beans with 1/2 of the ricotta cheese mixture. Top the ricotta layer with 1/2 of the beef and chorizo mixture. Top the beef and chorizo layer with 1/2 of the shredded Mexican cheese. Top the shredded cheese layer with 1/2 of the diced tomatoes, pico de gallo or your preferred salsa. Repeat the process again with the corn tortillas, adding a little more cheese on top for good measure; bake in the preheated oven for 30-35 minutes until cheese is melted. Garnish with sliced green onions and serve up with sour cream and guacamole. YUM--I'm definitely going to try this one! I'm a lasagna person too, and this sounds yummy. Chorizo, cheese, and tomatoes? Sold! This looks delicious. That's so funny! 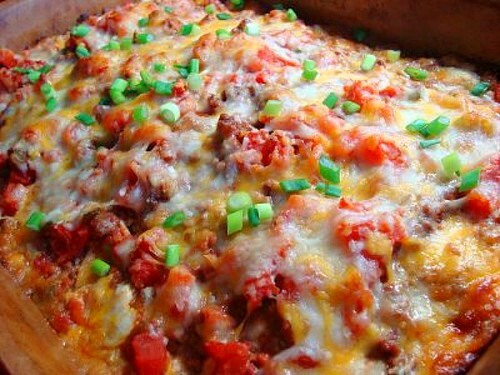 I tried to make a single version of Mexican lasagna last night, but yours looks even better! What a great recipe to feed a crowd! Who doesnt love chorizo! ;-) Thanks for posting! Mmm this looks so good. I love anything with chorizo! Just the way I like it: all the delicious goodness in one dish!